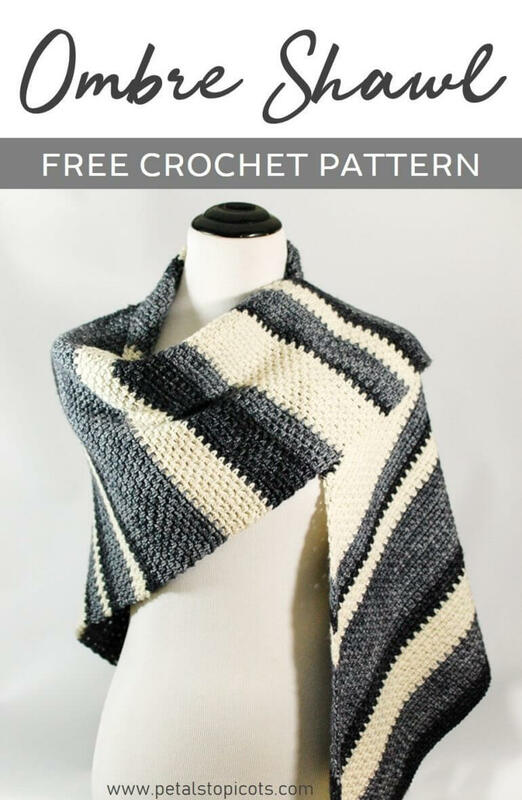 The gorgeous stitch texture and modern striping of this Ombre Shawl crochet pattern allows this shawl to pair just as easily with your favorite pair of jeans as it does over a little black dress, and it can be easily customized to any size you like. 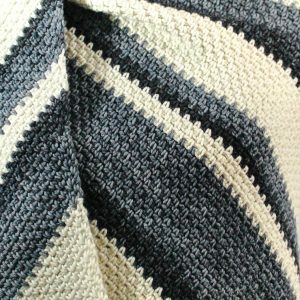 You can follow the basic shawl crochet pattern below and customize your colors and striping to fit your taste or you can follow my striping pattern included at the end of this post. Enjoy! 3 coordinating colors of DK weight yarn, approx. 450 yds of Color A, 450 yds of Color B, 225 yds of Color C (Shown here in Madeline Tosh DK in Antler, Charcoal, and Dirty Panther). The shawl pattern is a triangular shape where you begin working at one corner and increase until you reach the size you like. The finished shawl as written has an approximate wingspan measure of 64 in., with a 32 in. drop, however it is easily customization for any size you desire … just stop when you reach the size you like. Row 1: Work 3 sc in 2nd ch from hook, turn — 3 sc. Row 2: Ch 2, work [1 sc, ch 1, 1 sc] in first st, ch 1, skip next st, 1 sc in last st, turn — 3 sc. Row 3: Ch 2, work 1 sc in first ch-1 sp, ch 1, 1 sc in next ch-1 sp, ch 1, 1 sc in turning ch-2 sp from previous row, turn — 3 sc. Row 4: Ch 2, work [1 sc, ch 1, 1 sc] in first ch-1 sp, ch 1, 1 sc in next ch-1 sp, ch 1, 1 sc in turning ch-2 sp from previous row, turn — 4 sc. Row 5: Ch 2, work 1 sc in first ch-1 sp, ch 1, *1 sc in next ch-1 sp, ch 1, rep from * one more time, 1 sc in turning ch-2 sp from previous row, turn — 4 sc. Row 6: Ch 2, work [1 sc, ch 1, 1 sc] in first ch-1 sp, ch 1, *1 sc in next ch-1 sp, ch 1, rep from * one more time, 1 sc in turning ch-2 sp from previous row, turn — 5 sc. Row 7: Ch 2, work 1 sc in first ch-1 sp, ch 1, *1 sc in next ch-1 sp, ch 1, rep from * two more times, 1 sc in turning ch-2 sp from previous row, turn — 5 sc. Row 8: Ch 2, work [1 sc, ch 1, 1 sc] in first ch-1 sp, ch 1, *1 sc in next ch-1 sp, ch 1, rep from * two more times, 1 sc in turning ch-2 sp from previous row, turn — 6 sc. Row 9: Ch 2, work 1 sc in first ch-1 sp, ch 1, *1 sc in next ch-1 sp, ch 1, rep from * three more times, 1 sc in turning ch-2 sp from previous row, turn — 6 sc. Row 10: Ch 2, work [1 sc, ch 1, 1 sc] in first ch-1 sp, ch 1, *1 sc in next ch-1 sp, ch 1, rep from * across ending with 1 sc in turning ch-2 sp from previous row, turn — 7 sc. Row 11: Ch 2, work 1 sc in first ch-1 sp, ch 1, *1 sc in next ch-1 sp, ch 1, rep from * across ending with 1 sc in turning ch-2 sp from previous row, turn — 7 sc. Rows 12 through 197: Repeat Rows 10 and 11 ending with 100 sc at Row 197 or until you reach your desired size. This is a beautiful pattern! If I wanted to make it more of a shallow and longer triangle, how would you recommend adjusting the rows? 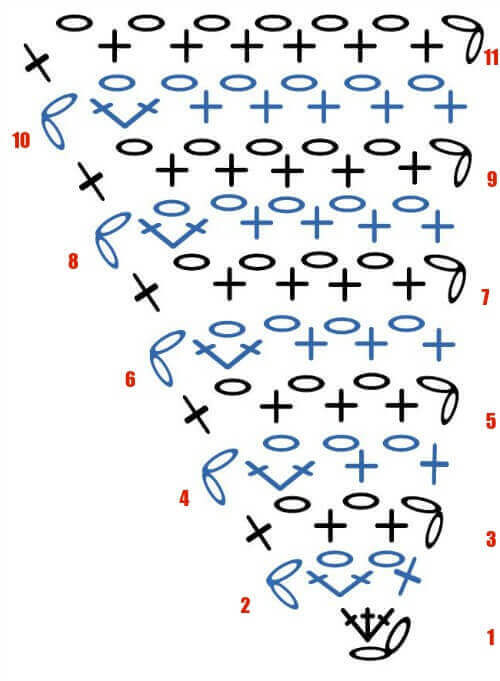 Is this pattern written in UK or American crochet terms? Beautiful pattern! i too amI to am having a difficult time starting the shawl. I would also appreciate a video just for the first 10 to 12 rows PLEASE. I wear it wrapped in a bunch of different ways …pulled over my shoulders like a traditional shawl, or with the very top folded over and then wrapped around, and even with the point in the front and around my neck like an oversized cowl. I too finished the shawl and have no idea how to wear it. Not a real triangle. One side is larger than the other. May try to extend the pattern to wrap around me better. I agree with the previous comment..a video on how to wear it would be helpful. Love this pattern. Used black, gray and white. Have yarn in Brown, pumpkin and mustard for my next one. Would it be possilbe to post a video of the first 12 rows. I’m making a mistake but can’t find out what I’m doing wrong. A short video for getting started on this would be highly helpful. I’m having difficulty with the turn and finding the chain spaces. 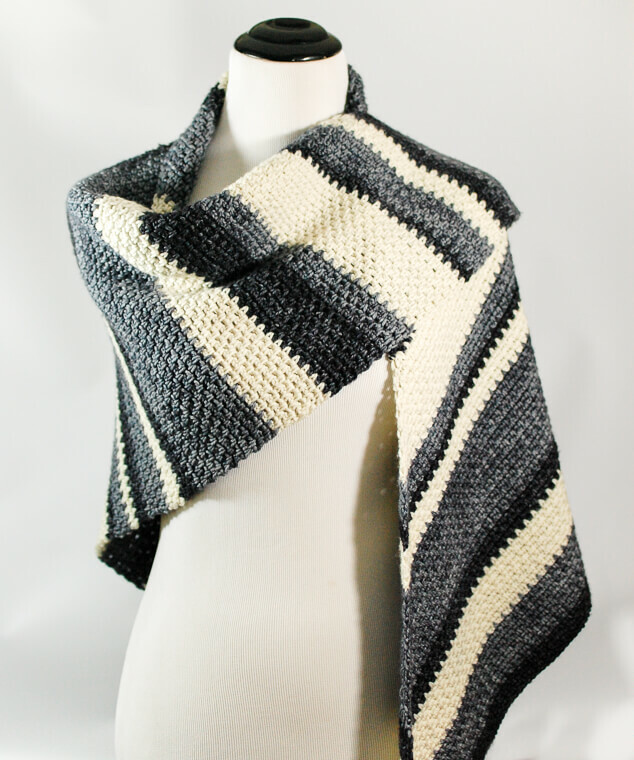 This shawl is gorgeous! Thank you for sharing this pattern! Can you tell me which of your yarn colors is color A, colorB, and color C? Sure, Color A = Antler, B = Charcoal, and C = Dirty Panther. All are Madeline Tosh DK. I love this pattern and cannot wait to get started 🙂 Do you have any tips on how to change colors easily so that the change isn’t as noticeable? I love this pattern! I am making one in different shades of pink. Like very much the pattern and the beautiful, fine colours! Thank you very much! Thank you so much! Can’t wait to get started. I really, really like this! Thank you so much! I love the stitch and the design!